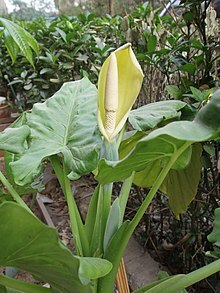 Alocasia macrorrhizos is a species of flowering plant in the arum family (Araceae) that it is native to rainforests from Borneo to Queensland and has long been cultivated on many Pacific islands and elsewhere in the tropics. Common names include giant taro, ʻape, giant alocasia and pai. In Australia it is known as the cunjevoi (a term which also refers to a marine animal). The giant taro was originally domesticated in the Philippines, but are known from wild specimens to early Austronesians in Taiwan. From the Philippines, they spread outwards to the rest of Island Southeast Asia and eastward to Oceania where it became one of the staple crops of Pacific Islanders. They are one of the four main species of aroids (taros) cultivated by Austronesians primarily as a source of starch, the others being Amorphophallus paeoniifolius, Colocasia esculenta, and Cyrtosperma merkusii, each with multiple cultivated varieties. Their leaves and stems are also edible if cooked thoroughly, though this is rarely done for giant taro as it contains higher amounts of raphides which cause itching. The reconstructed word for giant taro in Proto-Austronesian is *biRaq, which became Proto-Oceanic *piRaq. Modern cognates for in Island Southeast Asia and Micronesia include Rukai vi'a or bi'a; Ifugao bila; Ilocano , Cebuano, and Bikol biga; Tiruray bira; Ngaju biha; Malagasy via; Malay and Acehnese birah; Mongondow biga; Palauan bísə; Chamorro piga; Bima wia; Roti and Tetun fia; Asilulu hila; and Kowiai fira. In Oceania, cognates for it include Wuvulu and Aua pia; Motu and 'Are'are hira; Kilivila and Fijian via; and Hawaiian pia. Note that in some cases, the cognates have shifted to mean other types of taro. It is edible if cooked for a long time but its sap irritates the skin due to calcium oxalate crystals, or raphides which are needle like. Alocasia species are commonly found in marketplaces in Samoa and Tonga and other parts of Polynesia. The varieties recognized in Tahiti are the Ape oa, haparu, maota, and uahea. The Hawaiian saying: ʻAi no i ka ʻape he maneʻo no ka nuku (The eater of ʻape will have an itchy mouth) means "there will be consequences for partaking of something bad". The giant heart-shaped leaves make impromptu umbrellas in tropical downpours. The Yugarabul word for the plant "bundal" is also where the name of the suburb Boondall is derived from. ^ a b c "Alocasia macrorrhizos". World Checklist of Selected Plant Families. Royal Botanic Gardens, Kew. Retrieved 2016-09-30. ^ "Alocasia macrorrhizos". Natural Resources Conservation Service PLANTS Database. USDA. Retrieved 2016-09-30. ^ a b "Alocasia macrorrhizos". Germplasm Resources Information Network (GRIN). Agricultural Research Service (ARS), United States Department of Agriculture (USDA). Retrieved 2010-05-23. ^ a b Osmond, Meredith (1998). "Horticultural practices". In Ross, Malcolm; Pawley, Andrew; Osmond, Meredith. The lexicon of Proto Oceanic : The culture and environment of ancestral Oceanic society (PDF). Vol. 1: Material Culture. Pacific Linguistics. pp. 115–142. doi:10.15144/PL-C152.115. ^ Nauheimer, Lars; Boyce, Peter C.; Renner, Susanne S. (April 2012). "Giant taro and its relatives: A phylogeny of the large genus Alocasia (Araceae) sheds light on Miocene floristic exchange in the Malesian region". Molecular Phylogenetics and Evolution. 63 (1): 43–51. doi:10.1016/j.ympev.2011.12.011. ^ Manner, Harley I. (2006). "Farm and Forestry Production Marketing Profile for Giant Tao (Alocasia macrorrhiza)". In Elevitch, Craig R. Specialty Crops for Pacific Island Agroforestry (PDF). Permanent Agricultural Resource (PAR). ^ Matthews, Peter J. (1995). "Aroids and the Austronesians". Tropics. 4 (2/3): 105–126. doi:10.3759/tropics.4.105. ^ Susan Scott; Craig Thomas (2009). Poisonous Plants of Paradise: First Aid and Medical Treatment of Injuries from Hawaii's Plants. University of Hawaii Press. ^ Pukui, Mary Kawena (1986). ‘Ōlelo No'eau, Hawaiian Proverbs and Sayings. Honolulu: Bishop Museum Press. This page was last edited on 10 April 2019, at 04:56 (UTC).